Face and brain scan. 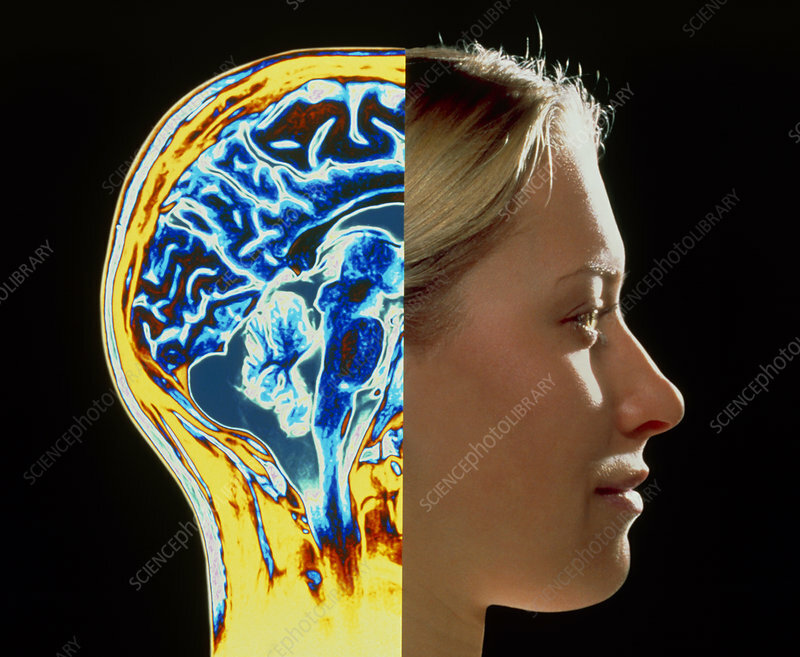 Coloured Magnetic Resonance Imaging (MRI) scan of the posterior half of the human brain superimposed on the profile of a woman's head. This scan is a sagittal section illustrating several structures, coloured blue within the yellow-coloured bones of the skull. The highly folded cerebrum is seen at top, this is mainly concerned with conscious thought processes. Below the cerebrum 2 major structures are also seen: the highly folded cerebellum (white & blue at centre left) coordinates muscle movement and posture; to the right of the cerebellum, the dark blue pons connects the mid-brain to the brainstem.